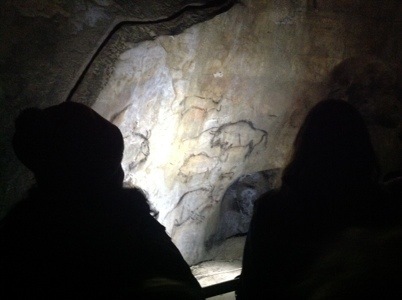 Cave Paintings – always been on my bucket list, so when the boss of this trip (you know who you are) reminded me of some fairly local prehistoric caves, off we went to the Ariage to visit Grottes de Niaux, an amazing cave whose enormous mouth right on the side of a mountain is visible from the road below. This experience was a little different from the one I blogged about earlier. 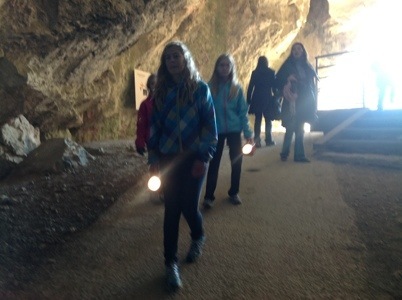 This system of caves was in more of a natural state – uneven, sometimes slippery floors, no lighting other than the flashlight provided at the beginning of the tour, and a few fairly narrow tunnels. It was a bit of a hike to get to the parts with the actual paintings, and along the way there was some “modern” graffiti on the walls. As in, 1605ish. Crazy. 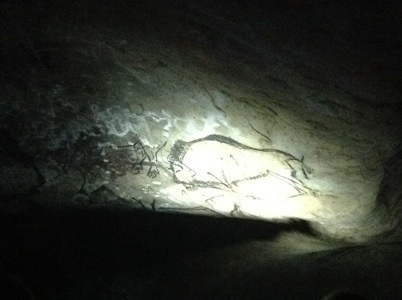 At that time, the people doing the graffiti didn’t know they were defacing prehistoric paintings because they didn’t know there were prehistoric people! It’s nuts. Really hard to get your head around. And when you get to the Salon Noir, where the really spectacular animal paintings are, it is just mind-boggling. They didn’t have language. They couldn’t count. But they could paint. And not just paint, but paint well. The likeness to the animals they depict is incredible. 13,000 years ago! Remember back when we were amazed at the age of the city of York? Built by Romans and Vikings? That was only 2,000 years ago. Like I said, mind-boggling. Hot Springs – another phenomenon I’ve never experienced. 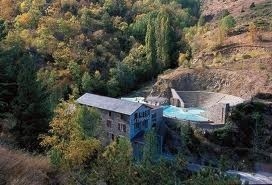 So, off we went the other day to one of the many thermal baths in the area. We would have taken this one in sooner except that we had no bathing suits, but this particular place rented bathing suits, so that’s what we did. Weird, yes, but better than buying a $50 suit I’ll never wear again. And WAY better than Dev buying a Speedo, because that’s what the men-folk have to wear in there! It was great. Good for a few giggles due to the rented bathing suits, but all forgotten once we submerged. The sensation of being in steaming hot water while surrounded by the chill of the autumn air was both restful and invigorating. We could see the snow covered mountains all around us, and actually, we wished it was snowing, because that would have made the experience even more of a paradox. Anyway, we loved it, (what’s not to love? ), and the kids loved it, despite some initial protestation from the one who does not like hot water. Ugh, it makes my muscles feel all soft and floppy – like I can’t stand up. It’s called relaxing. Give it a shot. It’s good for you. There’s more to say, but now I need to pack. A bientot!